Long Nightgowns - are a functional yet classic time honoured sleepwear favorite that women love. Over the years it has seen a resurgence in popularity, as modern designers have taken this old-fashioned, cotton lingerie undergarment to a new level of comfort and style. Thanks to a wide selection of colors, fabrics, and prints, you can find a gown that flatters your shape and adds feminine flair to your lingerie repertoire. If you are looking for something that's pretty, practical and on the conservative side for everyday wear, Miss Elaine sleepwear offers soft, flutter nightgowns in soft, pastel colors and patterns that are ultra feminine. Traditional in shape, these nightgowns tend to be free-flowing, relaxed and airy with plenty of room to move around in, making them an easy fitting sleepwear choice. Quality lightweight and stretchy nylon fabric is very comfortable and will withstand years of constant wear and washing while still looking beautiful. Even the delicate lace trim and stitching on their gowns is soft and non-irritating. One of our all-time favorites, Natori is a sought-after luxury sleepwear brand that makes a great gift for birthdays, anniversaries, Christmas, or just saying, "I love you" to your special someone. The beauty of Natori lays in its classic lines and simple styling. They offer flowing & sophisticated gowns. Their modal / polyester blends and silk nightgowns and robes are incredibly soft and form-flattering. 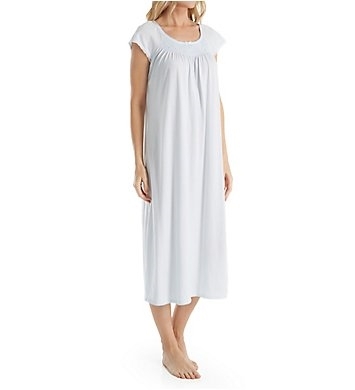 Natori nightgown length is shorter than traditional long gowns, falling just below mid-calf. Their easy pullover opening makes for no-fuss dressing, and minimal trim keeps the look and feel classic and fresh. Another popular long nightie that my customers enjoy, Unmentionables nightgowns are designed with plus sized women in mind. Offered in soft pastel and neutral shades, these night gowns are elegant and comfortable for larger women who need a little extra room and support (without underwires); especially those with a larger bustline. Minimal trim and detailing add charm to the tailored and elegant look of this lingerie brand. These long and sleek minimalist nightgowns are easy to maintain and wear well for years. If you love bold colors, Shadowline offers ankle length, nylon gowns in bright colors in purple, black, red and blue, as well as a plethora of softer shades. Their signature lightweight stretch fabric is breathable and soft, and at 53" long, it's a bonus for taller women. A wonderful benefit of the nylon material - it molds to your shape and moves with you, making sleep more comfortable. Another advantage - different styles all have a graceful flare that compliment larger sizes. 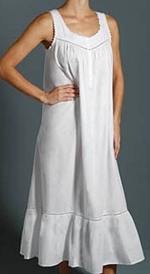 Modest enough to be worn throughout the day and evening, Thea has a nice selection of long cotton nightgowns. With high yokes, long sleeves and ankle-length hem, they're comfortable enough for sleep and loungewear, which makes them incredibly useful for many ages. Available in cool crisp white, Thea gowns are suitable for both winter and summer, and are reasonably priced, making them a great gift option. Shopping online for long nightgowns, chemises, and your favorite night gowns is easy on eBay clothing. From comfy cotton flannel nightgowns and feminine victorian nightgowns to the popular Miss Elaine nightgowns, the selection of chemises, slip lingerie, nightgowns sleepwear and intimate apparel has never been better.